recently a featured artist on Etsy creates great detailed artworks on a small scale with movie themes. 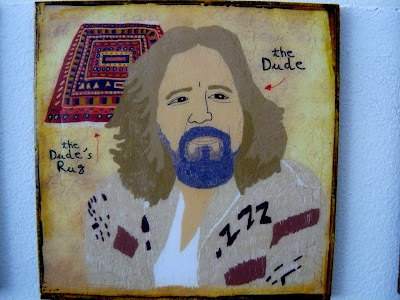 I bought the Big Lebowski set of coasters but have put them up on the wall where they won't be damaged by careless shenanigans after partaking- bound to happen ya see. A collection of Movie Directors might be next, but it's so hard to choose 'cos the likeness is remarkable and the choice so interesting. The Dude would be most impressed I'm guessing- go shop there right now!